Please indicate if you want a silver or black face plate in the comments section of the order if you place an order. If nothing is indicated a silver face unit will be shipped. Sales Policy : All sales are final no returns accepted.If any Jolida shipment is refused and or returned for any reason including a possible defect and no defect is found a 25% restocking fee will be imposed additionally customer will be responsible for all shipping charges to and from the shipping point.By placing an order you are accepting these terms.Free shipping applies to Domestic US destinations only. Who says good things don’t come in small packages. 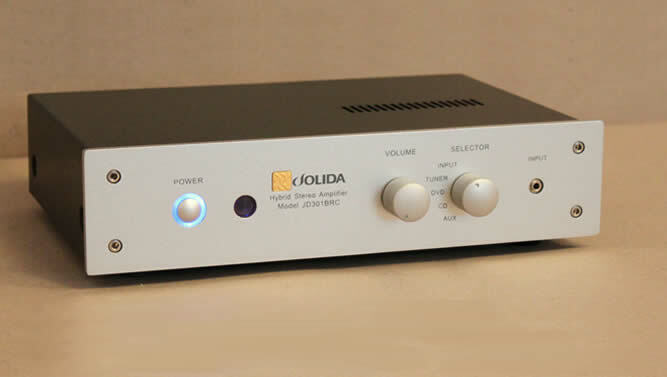 Combines the best of two worlds, a tube pre-amp with a solid state power amplifier with remote control. A smooth silky sound with pace, bass and power at an affordable price. Available in Black or Silver finish. Warranty: 18 months limited parts and labor. Six months or 1000 hours whichever comes first on Jolida Tubes. o Multiple Inputs: Front mounted selector switch - Input, Tuner, DVD, CD, and Aux. (for TV, VCR or Computer|). o State of the Art Components: ALPS audio potentiometer, gold plated RCA input jacks, and front panel minjack input. o State of the Art Components: ALPS audio potentiometer, gold plated RCA input jacks.